In some ways, I’m the worst guy to be in charge of emailing a newsletter out on behalf of my company Connectbeam. I’m very dismissive of spam email. I hang up on telemarketers without guilt, after quickly saying “put me on your do not call list”. I ignore newspaper and website ads, I don’t watch commercials. But newsletters are back in vogue it seems. Longtime blogger Jason Calacanis famously dropped his blog for an email newsletter. Chris Brogan maintains a newsletter. I subscribe to a newsletter provided by analyst relations firm SageCircle. Clearly there continues to be life in newsletters despite the advent of RSS. I guess I should rephrase that. The dominant form of online information distribution is email, with a RSS still a small part of the pie. And email does have some advantages – people spend more time there in a business setting. It also has an outreach aspect that bugs the hell out of A-List bloggers, but can be less intrusive for everyday people. As a young company looking to expand its brand and message, Connectbeam needs to consider the newsletter a part of its overall engagement strategy. So I recognize the importance of it, even as I’m probably the last person who would read anything like this. Which, in a way, made me well-suited for tackling this. The email went out to 253 people – we didn’t spam some purchased list of thousands of names. The subject line was: “Social Software During a Recession – Connectbeam Nov 2008”. I wanted the email to be topical, not some spam about a product release. My overall objective is to make the email useful, and to build Connectbeam’s presence out in the market. If I’m successful in the former, I believe I’ll be successful in the latter. A third objective is to advertise upcoming webinars as well. That’s going to be an ongoing battle, as I’ll describe below. There are four sections highlighted in the email graphic. Here’s what I was doing with each of those. The first challenge is getting people to open the email. Once you’re through that hurdle, next you’ve probably got 5 seconds to catch their attention. My guess is that people will do a quick scan of the different sections, then read the opening sentence at the top of the newsletter. In writing the opening message, I essentially wrote a mini-blog post. Readers of this blog know I’m a big fan of linking to others’ work, and this was no exception. I linked to a nice post by Jevon MacDonald on the FAST Forward blog. Then I added my two cents. Right off the bat, I wanted to give the reader something useful. A couple people clicked on the link to Jevon’s post. Something else that seemed important – putting my name on the email. I’ve been immersed in social media enough to know that a soul-less corporate entity as the sender immediately loses some of the engagement. It comes across as a pure marketing exercise. So I wanted my name on there. The other thing about putting your name on it? It raise your own expectations for the utility of the email. After all, people are going to associate its quality with you. Based on the click stats, this seems to been a successful part. That first link for the MIT study of a company’s implicit social network (I blogged about it here) has been clicked 18 times. Clearly people were digging that one. The IBM tagging savings story was clicked 7 times, which was not too bad either. My intention with this section is to design something that will be useful to recipients. Even if you currently have no interest in Connectbeam, you’ll find enough value in these links to continue receiving the email. That’s why I’m particularly attuned to the unsubscribe stats. Having only two people unsubscribe so far is a good start from my perspective. There are no silver bullets with this newsletter program. It’s not like I expect people to sign contracts after reading the email. I’m looking at the newsletter as a long term brand-building exercise, and as a basis for increased engagement over time. But the only way that works is if they agree to continue receiving it. Alas, this part of the email has not gotten a lot of love so far. I understand. Webinars are a time commitment. People have to make their choices. Enterprise vendor webinars are a tough sell. I’m starting to appreciate the finer points of webinars. When I was at BEA, I led a webinar for social search inside the enterprise, talking about general issues and the Pathways application. We had 80 attendees, including many from the Fortune 500 set. It established a baseline for me on these things. But the driver of that level of attention? BEA was a significant presence in the market. Many, many companies had BEA portal software, and were curious about the new social computing applications available for that. Connectbeam isn’t BEA. We don’t have nearly the presence. So a webinar by our company doesn’t yet have the fertile ground that a BEA did. One trick I’ve seen companies employ (which we even did at BEA), is to partner with a well-known analyst or consulting firm, or with a big-name vendor. 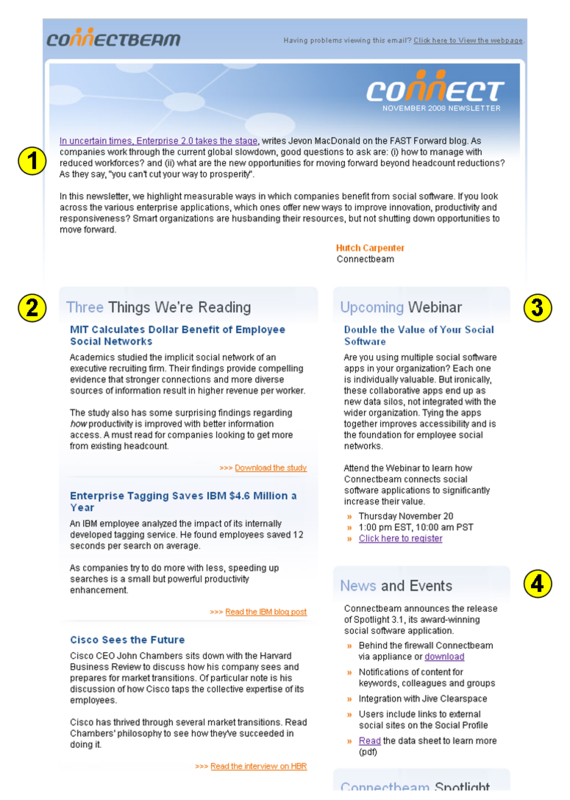 SocialText has done these with Forrester. NewsGator has worked with Microsoft. There’s an upcoming $100 webinar (yes, attendees pay $100!) by market research firm Radicati with Atlassian, SocialText and Telligent. This webinar partnering idea is one I’m going to look into more. In this section, I describe the recent 3.1 release of Connectbeam’s application. This is an area where I can give an update on what is happening with Connectbeam. It’s the closest thing we have to an annoying email PR blast about what we’re doing. But integrated into a useful email with other parts, I think it works. This section will rise on the email when I don’t have any upcoming webinars to tout. You now know my approach and objectives with this email program. I’m the guy who doesn’t like these things, put into a position of sending them out. And Connectbeam isn’t a major name like Google or Oracle, so there isn’t a ready-to-read audience out there. This stuff takes some hustle and experimentation. If you have any thoughts on what you see, or what’s worked well for you, I’d love to hear it. You should have discussed your choice of title more … if folks don’t open your email, all the other efforts are wasted. In addition, any newslettter should allow for a RSS subscription. I hear you Rich. Tough to say what will spur people to open an email. I didn’t want to lead with “Double the Value of Your Social Software”, because there were a fair number of media folks on the list. They’d likely chuck that email. Running at 29% open rate currently. Seems decent, not sure what to expect for that. SageCircle – thanks for your note. I’ve been impressed by the number of social media savvy types that continue to use a newsletter. Tells you that there’s still a role for good ol’ email.